Plasmodium Falciparum In Vivo Liver to Blood Stage in FRG Mice | Yecuris FRG: humanized animals and human hepatocytes platform for your next great discovery. Liver humanized mice have enabled researchers to study hepatotropic pathogens in vivo. For malaria, the infection does not transition from liver to blood since the humanized FRG mouse model still has mouse red blood cells, which can’t be infected by Plasmodium falciparum. To overcome this, the liver humanized mice received a blood exchange during the liver stage. During this seven-day period, most of the mouse red blood cells were substituted with human red blood cells. By using a parasite that expresses luciferase, the researchers were able to follow the infection from the liver stage into the blood stage. Next, they tested if a novel monoclonal antibody, which binds to a protein expressed on blood stage parasites (but not during the liver stage), is able to prevent the establishment of an infection in the blood. This proof of principle shows that with some modifications, the whole human host cycle of malaria can be replicated in an animal model. This now enables researchers to study the efficacy of novel therapeutics on both the liver and blood stage of malaria. The invention of liver-humanized mouse models has made it possible to directly study the preerythrocytic stages of Plasmodium falciparum. In contrast, the current models to directly study blood stage infection in vivo are extremely limited. Humanization of the mouse blood stream is achievable by frequent injections of human red blood cells (hRBCs) and is currently the only system with which to study human malaria blood stage infections in a small animal model. Infections have been primarily achieved by direct injection of P. falciparum -infected RBCs but as such, this modality of infection does not model the natural route of infection by mosquito bite and lacks the transition of parasites from liver stage infection to blood stage infection. Including these life cycle transition points in a small animal model is of relevance for testing therapeutic interventions. To this end, we used FRGN KO mice that were engrafted with human hepatocytes and performed a blood exchange under immune modulation to engraft the animals with more than 50% hRBCs. 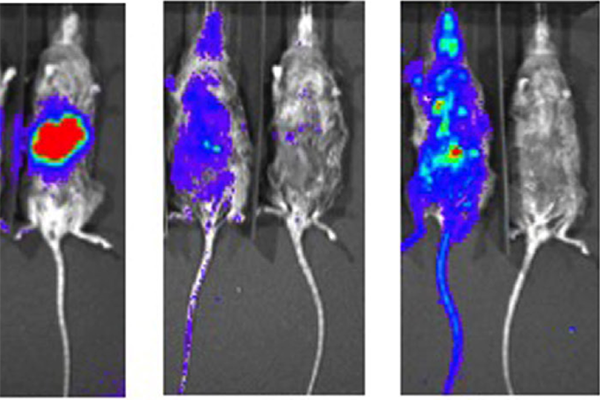 These mice were infected by mosquito bite with sporozoite stages of a luciferase-expressing P. falciparum parasite, resulting in noninvasively measurable liver stage burden by in vivo bioluminescent imaging (IVIS) at days 5–7 postinfection. Transition to blood stage infection was observed by IVIS from day 8 onward and then blood stage parasitemia increased with a kinetic similar to that observed in controlled human malaria infection. To assess the utility of this model, we tested whether a monoclonal antibody targeting the erythrocyte invasion ligand reticulocyte-binding protein homolog 5 (with known growth inhibitory activity in vitro ) was capable of blocking blood stage infection in vivo when parasites emerge from the liver and found it highly effective. Together, these results show that a combined liver-humanized and blood-humanized FRGN mouse model infected with luciferase-expressing P. falciparum will be a useful tool to study P. falciparum preerythrocytic and erythrocytic stages and enables the testing of interventions that target either one or both stages of parasite infection.